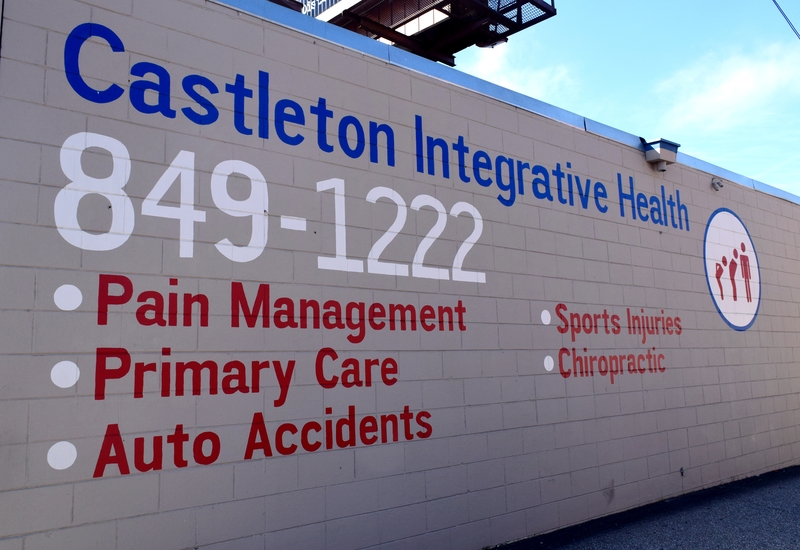 Castleton Integrative Health uses a comprehensive chiropractic approach to improve the health and wellness in all areas of patients’ lives—whether they are having problems with back stiffness, neck pain, or just want to start feeling better when they wake up in the morning. Castleton Integrative Health takes a “whole person” approach in chiropractic care, which means looking for the underlying causes of disease, discomfort, and pain as opposed to just treating symptoms. Many seemingly unrelated symptoms often arise from imbalances in the spinal column. Our medical experts will be able to determine the cause of the pain and create a personalized chiropractic and wellness plan to suit each patient’s individual needs. Under the care of our licensed chiropractor and skilled medical staff, patients report a higher sense of well being in all areas of their lives. Dr. Jason Domenick was born in Sewickley, Pennsylvania and spent the majority of his formative years in the suburbs of Youngstown, Ohio. He cites the strong mid-western values in the Ohio area and his experience with athletes and the labor environment as the driving forces leading him to achieve his Doctorate in a Physical Medicine such as Chiropractic. He first moved to Indianapolis in 1990 to pursue a degree in Biology and to play collegiate NCAA Div. 1 men’s varsity soccer on a scholarship. After his experience at Butler, he played professional soccer, coached collegiate NCAA Div. 1 soccer and worked in nursing/hospital administration/QA. He then went on to earn his Doctorate at National University of Health Sciences in Lombard, Illinois. While earning his degree, he served as both the Microbiology Fellow and finished a post-graduate/post-doctoral education in Acupuncture. He has been a Licensed Chiropractor and Acupuncturist since 2010. Dr. Domenick moved back to Indianapolis in 2012 to pursue work in the chiropractic field and to enjoy the centralized hotbed of athletics that Indianapolis has become. He continues to be involved in his alma mater (Butler) and local sports organizations and youth soccer development. He looks forward to helping as many people as possible in Indy’s diverse social and ethnic population. When he’s not in the office, you might catch him playing soccer in the local men’s league, coaching youth teams or training at the gym. Strike up a conversation if you’d like; he loves sports and playing the guitar or bring up one of your favorite pastimes or subject. He has a dream of owning a bed and breakfast / vineyard. Dr. Domenick is excited to be part of the team at Castleton Integrative Health and looks forward to meeting you and getting you on the road to recovery and wellness. Dr. Domenick offers many services including chiropractic, acupuncture, stretching and even works on feet, arms and shoulders and gets great results from pain relief! Our Nurse Practitioner, Linda Calli, is an advanced practice registered nurse who is educated and trained to provide health promotion and maintenance through the diagnostic treatment of acute illnesses and chronic conditions. She also specializes in trigger-point and joint injections. She received her undergraduate in Nursing from St. Francis College in Peoria and her Master of Science in Nursing from Indiana University. She has over 15 years of experience working as a Nurse Practitioner throughout Indiana. The Front Office staff – greets patients, schedules appointments, gathers billing information, and collects payments. They make sure we have current information on our patients in order to communicate patient needs to our insurance providers. Our Medical Record Specialist will assist with needs that you may have whether it be a copy for own personal use or to send them to another medical clinic. A Medical Records Release is required and can be completed during your first visit.